The terms "settling", "sedimentation" are used in practice for several theoretically different facets of the processes (free and hindered settling, thickening). In activated sludge samples, settling can be observed as movement of liquid-solid interface downwards in time. Settling/thickening velocity can be measured. The velocity depends on activated sludge concentration, on sludge characteristics and settling conditions (size and shape of the settling volume, mixing etc.). In practice, sludge characteristics is measured as sludge volume index SVI or its modifications. For additional reading, see Ekama et al. (1997). Maximum settling velocity (for MLSS concentration approaching to zero) is 6-7 m/h. 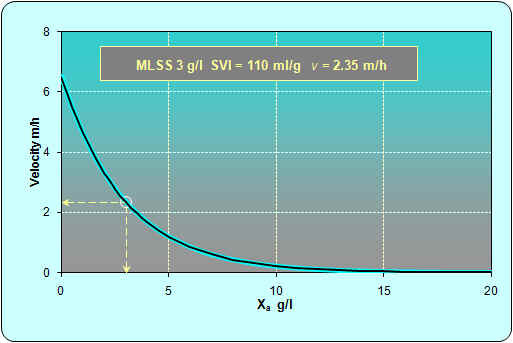 At typical mixed liquor suspended solids concentration (MLSS) Xa = 3 g/l and sludge volume index SVI = 110 ml/g, the zone settling velocity is 2.35 m/h. 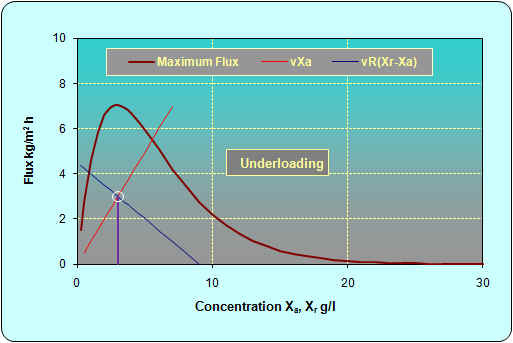 If considering non-uniformity of velocities in the clarifier cross section, maximum overflow rate (OFR) for successful separation of suspended solids must be significantly less than 2.35 m/h (see the graph on the right). Higher OFR would be possible at smaller Xa and/or SVI. Additional restriction is imposed by thickening requirements (see below). defines the state point (operating point) of the clarifier, as shown in the figure. 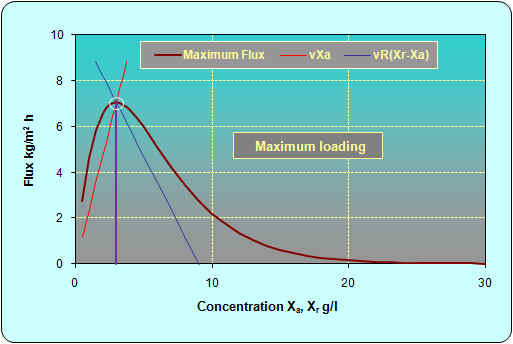 vR(Xr - Xa) "bulk flux"
For design purposes it is usually impossible to measure flux curves of the appropriate sludge (for instance in a in case of designing new plant). Thus a generalized flux curves have to be calculated, based on regression analysis of a large number of measurements. Operating point (white circle at crossing of the red and the blue line) must be below the safe flux curve. 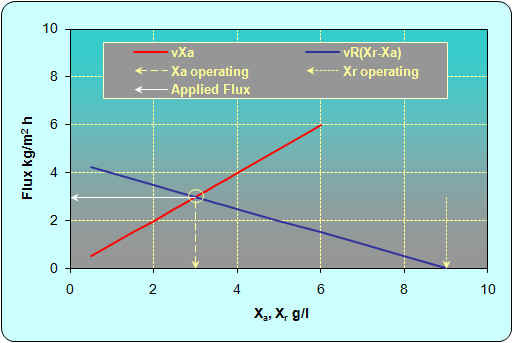 Bulk flux line (blue line) must be below the safe flux curve at any point to the right from the operating point. 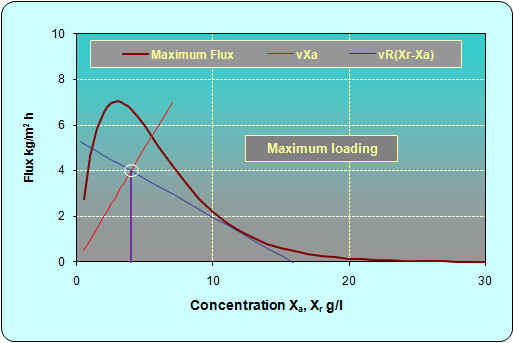 Safe design should not be based on the maximum flux curve measured or generalized but only on about 80 % of the value at any point (safe flux curve), depending on detailed design of the clarifier (see Ekama G.A. and Marais G.vR. (1986)). An example of limiting situations is shown in the following two figures. For easy comparison with previous figures, the maximum flux curve is identical. All parameters used are the same as before, except increased Xa from 3 g/l to 4 g/l and decreased R from 0,5 to 0,37. In consequence, Xr increased to 15.8 g/l. The limiting layer in the clarifier is the isoconcentration of about 12 g/l. For safe operation, the load will have to be reduced to 80-90% or the recycle ratio increased (the blue line will turn right around the state point). The clarifier design details and short-circuiting have to be considered as well. Same case but the clarifier is operated at maximum overflow rate possible, 2.35 m/h. Xr must be decreased to 9 g/l.. The main difficulty in estimating the limiting situation is a poor correlation between SVI (and all its variations) and flux, and further, the sludge blanket height (which is not a parameter of the flux analysis).